I was in St Matthews in the City on Sunday. As is my custom, I had delayed my flight back to Christchurch so I could attend. St Matthews was the last refuge for me, a place unashamed of being progressive, a place where questioning and doubt was allowed. It had more recently become less comfortable, but it remained special as one of the only places of connection for me, after a lifetime of living and working in the Anglican Church. The last straw was Sunday – it was a seemingly insignificant thing. It was a well-known hymn with a tunemost people did not know. It was not the hymn, but the fact that it was sung toa tune hardly anyone in the congregation knew. The hymn was rendered an organ solo and not a communal act of joining together in song. It was not the first time this has happend, it has happened many times before, but this time it caught me unawares, it struck me with force, it knocked me over. I sat down wondering what had happened to me. For me it was one step too far, a straw to break a camel’s back. And with that straw my last refuge in the Anglican Church was no longer a safe place – my heart broke and tears flowed. That hymn was a symbol of the disconnection between what happens in the front of the church (the important stuff) and what happens in the pews (peripheral). Inherent in the architecture of most Anglican churches is this disconnect between the front – the holy, the separate, the ordained, the special clothes and the pews where lay people sat. In some churches a screen separates the two – in these churches the squire and royalty sit in the holy place not the pews. This architecture underlines what is important and gives value to it. The Anglican liturgy is a reflection too of this division between holy and the others. The NZ Prayer Book made some allowance for simpler services, with less pageantry, but they are rarely used, apart from in homes and by bedsides. So the service begins – we stand to sing a hymn usually about God’s greatness, we say the Gloria – always about God’s greatness. We ask forgiveness for our sins. This theme of God’s greatness and our sin and our need continues through the prayers, the great thanksgiving, and our taking of communion. We occasionally sing a song (if it is singable), and we repeat some responses (or sing them). It is not until the final act of the service that we are told to Go out and be God’s people in the world. 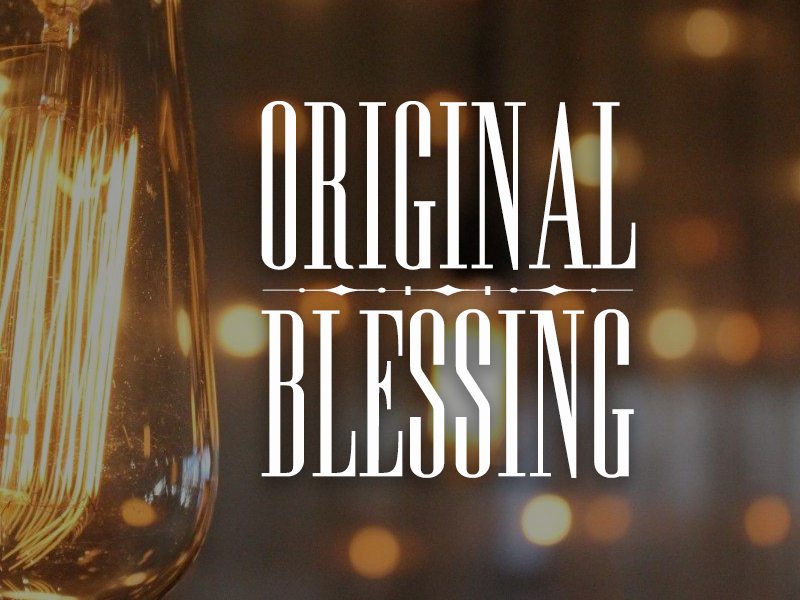 Since reading Matthew Fox’s book Original Blessing 30 years ago, I have embraced a theology in which we are partners with God in God’s world. I am not a miserable sinner (though God knows I am not perfect). The Anglican Church has been my spiritual home since I was born. As my dear friend Judith Dale used to say,Christianity and the Anglican way is my mother tongue. I grew up as a Sydney Anglican, I went forward at a Billy Graham Crusade, I studied Biblical Studies at University,became a charismatic, lived in Christian Community on the Coromandel and at StPauls, I worked in the Anglican Church, managed the St Pauls Outreach Trust,sat on Synods, helped to set up the Christian feminist Women’s Resource Centre,chaired a national board of theological education, ran a programme called FutureChurch with Methodist funding support. More recently my relationship with the Church has been a love hate relationship as I saw it become more and more insular and less connected to the world around it. The gay lesbian battle was a part of it, but not the whole story – you could still find a few places where full acceptance was taken for granted. St Matthews in the city, the rainbow Church, the Methodist Church, the Quakers. The focus is on those up front imparting blessing, music and knowledge. The focus is not on gathering up in the Liturgy – the Work of the People, the stories and struggles and questions of those who gather. This is entirely possible to do within the Anglican Liturgy, but not without work, because the liturgy reflects the normalcy of the buildings, which in turn reflect God’s otherness and our insignificance. The challenge is to rediscover Liturgy as the work of the People, to focus on empowerment and gathering the stories of those present into the great story of God’s presence in our world. To touch people’s souls. I spent some time on the Liturgical Commission and I worked with Father David Balfour on Liturgy at St Pauls Symonds St. There he taught this conservative evangelical from Sydney, the power of the drama of the liturgy,the power of a ritual done well to speak to people and to transform lives. I learnt that every action in the drama had a purpose, and we needed to make sure that purpose was what was intended. We had to gather the people up into the grand redemptive drama. Major festivals like Christmas and Easter were not services to be organised, but dramas to be re-enacted and claimed for its relevance in our lives now. As members of the congregation we were invited to relive that drama and let it connect with the story of our lives. I vividly remember the service at St Pauls where we gathered after the Springbok Tour. It was like a hospital ward – my flatmate Tim had no front teeth (from a police baton), someone else had a broken collarbone. There was the policeman who had been on the other side of the fence. There were the many who had marched against the tour and the few who had opposed our involvement. In that remarkable service we gathered up all those stories into the mystery of God, we sat with our pain and confusion in the presence of God. There was no rush to answers and healing, but there was a desire to remain connected in all this confusion with each other in this community and with the mystery that is God. I don’t know how to finish this, except to say goodbye and good luck. PS I have had an ‘official’ response to this letter, which is pretty much good luck with your life, rather than an invitation to a conversation. What a painful struggle this must be Rosemary. I gave up on the Anglican Church long ago, when I first went to university, even though I’d be christened and confirmed there, and also went up when Billy graham came to Auckland. I never found any joy in signing hymns as they were far out of my vocal range. When I discovered chanting as part of my Indian meditation path I was overjoyed. And yet St Matthews does a wonderful inclusive thing each year when the labyrinth is set out in river stones. I have a profound experience each time I walk it in the week before Easter. I feel that the sacred is alive in that place once again. thanks Juliet – you have been such a gift to those of us seeking new ways of touching the sacred within and without. Where did your Open letter to St Matts go to, and any response? Hi Rosemary – I can only comment that the time when we women could be stroppy, picketed Bishops meetings, standing committees etc, wrote bluntly, created the Women’s Resource Centre, held feminist meetings with some resourcing/support from men who tried to “get it” – were safer times. I have never felt so vulnerable about speaking my mind, making a critique as I do now. The narratives are controlled by a “father knows best” climate (YES we DO need CLIMATE change), the resurgence of patriarchal language, and the growing lack of transparency is not so much that we didn’t do a good and powerful work – the truth is that we did it too well. Hi Erice, lovely to hear from you – very sad but true it seems. Interesting at a time of the death of a young traveller to our shores, and a reminder of our frightening domestic violence statistics, that the Church has not connected the dots about their own culture of bullying and control. Hi Rosemary, thank you for the story of your journey. I some ways it is like mine but in others it is avery different. Like you my spiritual home was the Anglican Church but I grew up in England, in the Church of England, which was woven through the fabric of the society. I also grew up in a beautiful part of England and walked the hills with family and friends and on my own, through the forties and early 50s. The Church festivals celebrated Nature’s seasons. and Harvest festival saw us fill the church with fruit and vegetables. Fast forward to New Zealand and the sixties, The church offered me leadership and companionship as well as food for my soul. In the 70s, full time work as a Science and Biology teacher while raising our family , meant life was busy. And through it all the church, the liturgy, the scripture, the music all remained central. The 80s began with the Springbok tour and I did a theology degree. .I joined CORSO and discovered Structural Analysis. Sadly I had less opportunity to be with Nature, as farming had colonised her. I managed some tramping but I missed the English wild flowers, birds and mammals that I grew up with. However I was privileged to take school students to Tautuku every year and developed my love affair with the Catlins, unspoillt Aotearoa except for the dearth of birds, decimated by the introduced mammals., So I joined Native Forest Action. Reading now was feminist and Liberation theology. and the church seemed increasingly out of touch with if not hostile to all these issues. Yet I managed to hold on to a God of Love, a sense of being led by the Spirit. I was active in NZ politics, and joined the Labour Party, but 1984 put and end to that. I gave up teaching and got involved in community development and Maori whakawhanaungatanga. I discovered Green politics in the 90s and discovered a world of alternative spirituality and science. Celtic services were a revelation, Hildegard of Bingen, Thomas Berry, Brian Swimme, Joanna Macey. I still loved the drama of the liturgy that you described Rosemary but I lost God and discovered Gaia.. The liturgies seemed fossilised and the turning point for me was when the vicar led the children round the stations of the cross in the liturgy. I was appalled. The emphasis on suffering and guilt dismayed me. Lent, 6 weeks of flagellation, Passiontide, and the sudden realisation that Christianity was a cult! The language of communion, drinking blood, all the things I had been doing for 70 years became totally unacceptable. The volume of doctrine built up over the centuries, God the father, virgin birth, resurrection, no longer worked as metaphor for me. I managed to plan one service a year to celebrate the Cosmos and the Earth but it was clearly not a priority. At the same time my children, now parents themselves all lived full and meaningful lives, committed to social justice and environmental justice and engaged in making music and painting. They had been confirmed in the Anglican church but it had never made sense to them. I walked away and felt liberated. I still created Celtic liturgies for a while but when Helen Mann died my last links with the church went with her.. I am fortunate to still have my friends from DAWN and we meet regularly but even they do not understand why I have left. I cannot call myself a Christian any more although I am hugely grateful to the Church as I believe he inspired belief in a God of love. But I believe humanity is innately loving, cooperative, compassionate,, I don’t know much about the ancient religions but Buddhists, and Muslims both teach great human values. Jesus is to some extent the product of humanity, the prophets, the gospel writers, and St Paul. I celebrate his strong sense of inclusiveness, and call to be non judgemental but modern Christianity, conservative and fundamentalist, has long lost sight of these.. I believe the church has to die if humanity is to gain its sense of unity with the natural world and learn to live in harmony with the Earth and one another. I realise I have not said anything about the divine, the sacred.. I no longer use the word God but I recognise the sacred, the presence of the divine in the material world, individuals and living creatures, the ocean and the rocks. A personal God of love is more problematic for me faced with the old problem of suffering of the innocent. Sorry this turned out to be so long, no time to edit. After realising (at quite a young age but being caught in church dogma/tradition by family circs) how many lies were told and abuses perpetrated in the institutional church and being betrayed myself by a member of said churh (who confessed on his deathbed), I had left decades before that recent act … and decided my faith was in the ability of good humans to effect change for one another through acts of courage and speaking out and kindness. I am repelled by liturgy. Which was confirmed on a post quake visit to Rome – my last O.E. booked before quakes. Many in my family have ‘unshakeable faith’ in a god an after life, Yet their lives are not ones of charity or empathy or kindness. I believe this is it, we are stardust, we choose and make the difference for the fraction of infinity we have.